When a microservice application is deployed in production, it usually has many running containers that need to be allocated the right amount of resources in response to user demands. Also, there is a need to ensure that the containers are online, running and are communicating with one another. The need to efficiently manage and coordinate clusters of containerized applications gave rise to Kubernetes. Kubernetes is a software system that addresses the concerns of deploying, scaling and monitoring containers. Hence, it is called a container orchestrator. Examples of other container orchestrators in the wild are Docker Swarm, Mesos Marathon and Hashicorp Nomad. Kubernetes was built and released by Google as an open-source software, which is now managed by the Cloud Native Computing Foundation (CNCF). 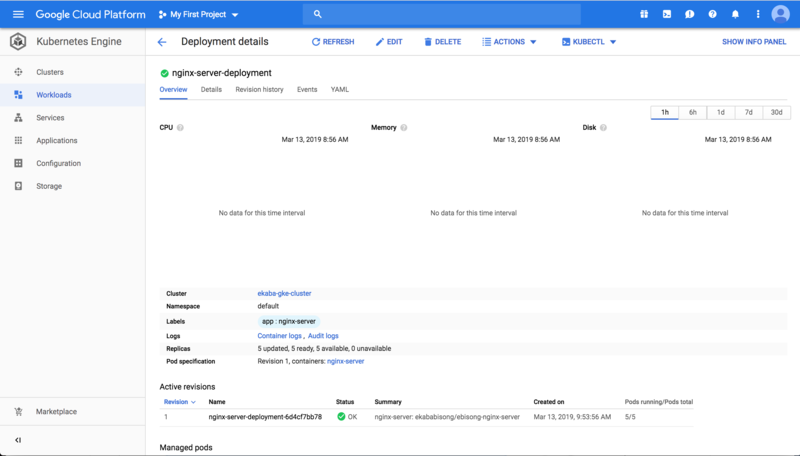 Google Cloud Platform offers a managed Kubernetes services called Google Kubernetes Engine (GKE). Amazon Elastic Container Service for Kubernetes (EKS) also provides a managed Kubernetes service. Horizontal auto-scaling: dynamically scales containers based on resource demands. Self-healing: re-provisions failed nodes in response to health checks. Load balancing: efficiently distributes requests between containers in a pod. Rollbacks and updates: easily update or revert to a previous container deployment without causing application downtime. DNS service discovery: Uses Domain Name System (DNS) to manage container groups as a Kubernetes service. Master node(s): manages the Kubernetes cluster. They may be more than one master node in High Availability mode for fault-tolerance purposes. In this case, only one is the master, and the others follow. 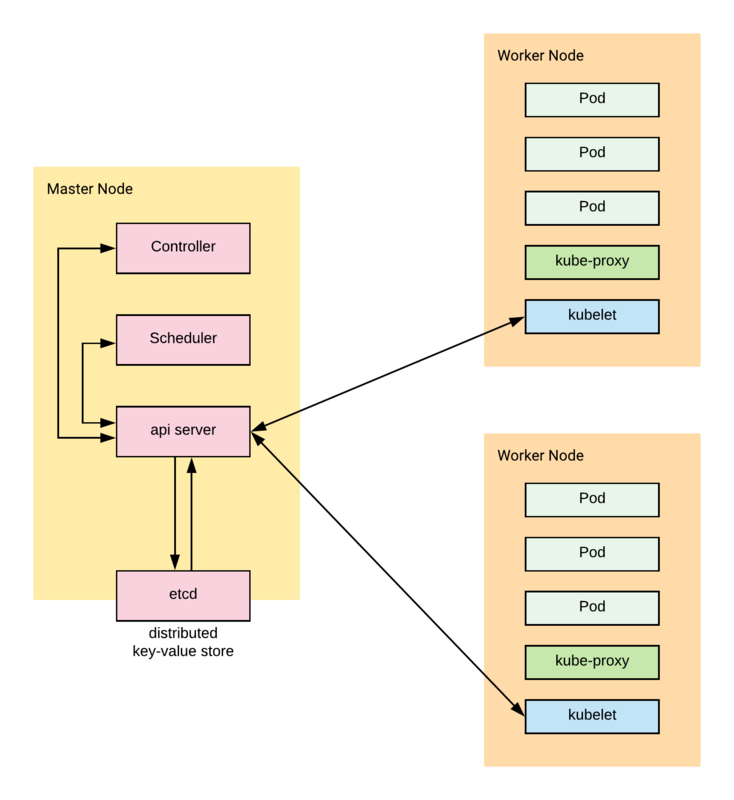 Worker node(s): machine(s) that runs containerized applications that are scheduled as pod(s). The illustration below provides an overview of the Kubernetes architecture. Later, we’ll briefly go through the individual sub-components. etcd (distributed key-store): manages the Kubernetes cluster state. This distributed key-store can be a part of the Master node or external to it. Nevertheless, all master nodes connect to it. api server: manages all administrative tasks. The api server receives commands from the user (kubectl cli,REST or GUI), these commands are executed and the new cluster state is stored in the distributed key-store. scheduler: schedules work to worker nodes by allocating pods. It is responsible for resource allocation. controller: ensure that the desired state of the Kubernetes cluster is maintained. The desired state is what is contained in a JSON or YAML deployment file. kubelet: the kubelet agent runs on each worker node. It connects the worker node to the api server on the master node and received instructions from it. Ensures the pods on the node are healthy. kube-proxy: it is the Kubernetes network proxy that runs on each worker node. It listens to the api server and forward requests to the appropriate pod. Important for load-balancing. pod(s): consists of one or more containers that share network and storage resources as well as container runtime instructions. Pods are the smallest deployable unit in Kubernetes. Pods: a collection of one or more containers. ReplicaSets: part of the controller in the master node. Specifies the number of replicas of a pod that should be running at any given time. It ensures that the specified number of pods is maintained in the cluster. Deployments: automatically creates ReplicaSets. It is also part of the controller in the master node. Ensures that the clusters current state matches the desired state. Namespaces: partition the cluster into sub-clusters to organize users into groups. Service: a logical group of Pods with a policy to access them. ServiceTypes: specifies the type of Service e.g. ClusterIP, NodePort, LoadBalancer, ExternalName. As an example, LoadBalancer exposes the service externally using a cloud provider’s load balancer. Other important tags in writing a Kubernetes Deployment File. spec: describes the desired state of the cluster. metadata: contains information of the object. labels: used to specify attributes of objects as key-value pairs. selector: used to select a subset of objects based on their label values. The deployment file is specified as a yaml file. The example in the next sections deploys the nginx server image that was pushed to Dockerhub in the previous section to a Kubernetes cluster. The image is accessible at https://hub.docker.com/r/ekababisong/ebisong-nginx-server. This code snippet of a Service object is saved in kubernetes-intro/deployment.yaml. This code snippet of a Deployment object is saved in kubernetes-intro/deployment.yaml. Minikube makes it easy to install and run a single-node Kubernetes cluster on a local machine. Go to https://kubernetes.io/docs/tasks/tools/install-minikube/ for instructions on installing Minikube. Install a hypervisor e.g. VirtualBox. minikube status Check if Minikube is running. minikube start Create local kubernetes cluster. minikube stop Stop a running local kubernetes cluster. minikube dashboard Open Minikube GUI for interacting with the Kubernetes cluster. Append & to open in background mode minikube dashboard &. minikube ip get ip address of Kubernetes cluster. kubectl get all list all resources. kubectl get pods list pods. kubectl get service list services. kubectl get deployments --all-namespaces list deployments for all namespaces. kubectl create -f [DEPLOYMENT_FILE.yaml] create a new resource based on the desired state in the yaml file. kubectl apply -f [DEPLOYMENT_FILE.yaml] if the resource already exists, refresh the resource based on the yaml file. kubectl delete -f [DEPLOYMENT_FILE.yaml] remove all resources from the yaml file. kubectl get nodes get the nodes of the Kubernetes cluster. kubectl delete deployment [DEPLOYMENT_NAME] delete the deployment with [DEPLOYMENT_NAME]. kubectl delete svc [SERVICE_NAME] delete the service with [SERVICE_NAME]. kubectl delete pod [POD_NAME] delete the pod with [POD_NAME]. Let’s access the application inside the Kubernetes cluster by running 192.168.99.102:30001. We use the port 30001 because we are accessing the application from outside the cluster. 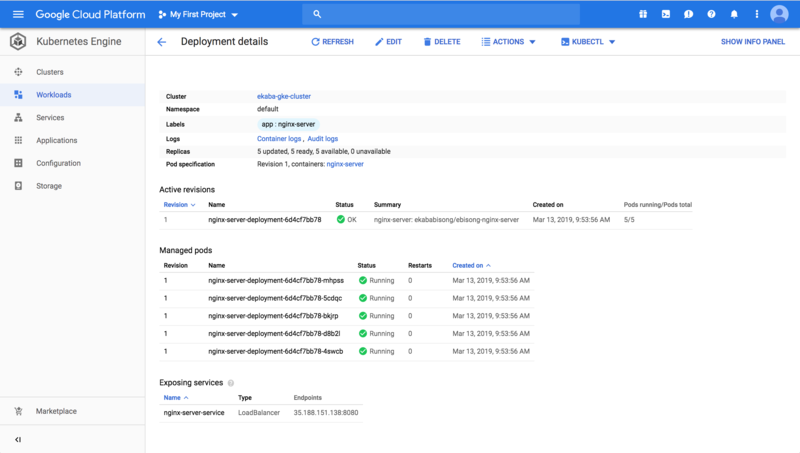 To create and deploy resources on GCP from the local shell, the Google Command line SDK gcloud will have to be installed and configured. If this is not the case on your machine, follow the instructions at https://cloud.google.com/sdk/gcloud/. Otherwise, a simpler option is to use the Google Cloud Shell which already has gcloud and kubectl (the Kubernetes Command line interface) installed. A Kubernetes cluster is created on GCP with 3 nodes (as default). Creating cluster ekaba-gke-cluster in us-central1-a... Cluster is being deployed...done. kubeconfig entry generated for ekaba-gke-cluster. 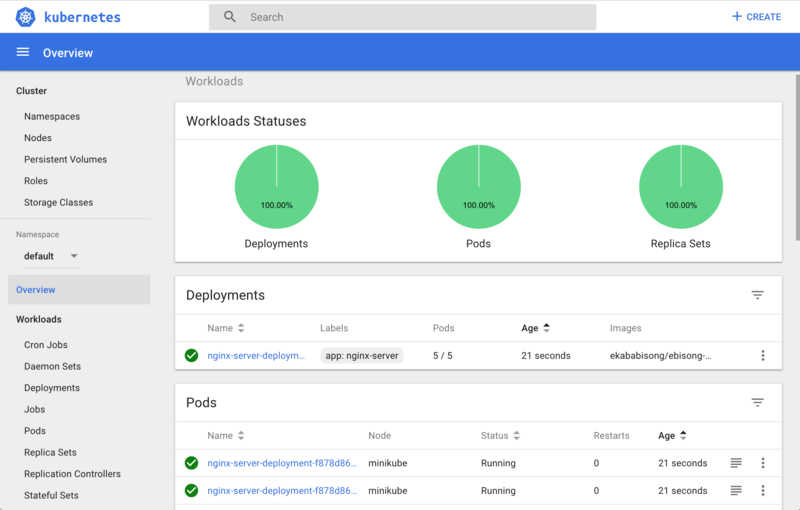 To learn more about creating clusters with Google Kubernetes Engine, visit https://cloud.google.com/kubernetes-engine/docs/how-to/creating-a-cluster. Access the deployed application on GKE by running 35.188.151.138:8080.